On Friday’s CBS Early Show, co-host Harry Smith talked to a panel of working moms about the media questioning Sarah Palin’s duel role as a mother and a vice presidential candidate: "Why is it that every time a woman starts ascending up a certain part of the food chain, we have this conversation all over again?...Now, if Sarah Palin's husband were in her spot, would we have asked that question in one second?...Fair or unfair, all this -- this whole conversation, and do you still feel there's a double standard?" Compare those questions by Smith to comments by co-host Maggie Rodriguez on Wednesday, during an interview with Rudy Giuliani. The former New York City mayor and McCain supporter criticized the questions of Palin’s parenting: "They're asking can she be vice president and be a mother. Come on." Rodriguez replied: "I think they're fair questions. It's a lot to juggle." Also on Wednesday, Rodriguez led a panel discussion on Palin by asking: "The question, can a mother of five, including an infant with Downs Syndrome, be an effective vice president?" During Friday’s segment, one of the members of the panel, Lisa Witter, observed: "Well, I personally think that if Sarah Palin were Joe Palin, we wouldn't be having this conversation." Smith replied to that with: "Amen." SARAH: From the inside, no family ever seems typical. And that's how it is for us. Our family has the same ups and downs as any other, the same challenges and the same joys. MAGGIE RODRIGUEZ: V.P. nominee Sarah Palin sparks a national debate over working moms. So can women have it all? We'll hear from all sides. MAGGIE RODRIGUEZ: Sarah Palin has sparked a debate in this convention. Let's go back to Harry in New York for that. Harry. HARRY SMITH: Alright, thanks very much, Maggie. This week, Governor Sarah Palin ignited the debate -- re-ignited it, shall we say, about mothers balancing family and career. UNIDENTIFIED WOMAN A: I don't see how can she do it. How she can do it all. UNIDENTIFIED WOMAN B: Finally someone is coming into the spotlight that is a multi-tasker. That's what women do. SMITH: Joining us now are three working moms, Julie Menin, Lisa Witter, and Vicky Iovine. And thank you all for joining us this morning. I remember being on television 30 years ago and having this conversation. Why is it that every time a woman starts ascending up a certain part of the food chain, we have this conversation all over again? Why do you think? SMITH: Sure. Now you all have kids, right? SMITH: How old are you kids? IOVINE: 14, 16, 18, 20. SMITH: How old are yours? JULIE MENIN: Twins who are 3 and a 5-year-old. SMITH: Holy Cow. So you know all about this whole balancing act. How is it, though, that we continue to have this conversation? Is it because it is so difficult? WITTER: Well, I personally think that if Sarah Palin were Joe Palin, we wouldn't be having this conversation. WITTER: Despite the fact that I'm finding the men of my generation asking that of themselves. Like why is it always on you, Lisa, it should be on me too. That's the conversation my husband is having. It's hard for men too. And so that's why I think it's different than the debate or conversation 30 years ago, is men are saying 'I have responsibility too.' And that's a good thing. Now, most women don't have the choice. You know, it's a privilege to be able to stay at home with your kids because we have two people working in the family. So that conversation needs to happen too. SMITH: Right, what is your thought about all of this? As it's been re-ignited again. MENIN: I think it's a little bit different. I think the glass ceiling in politics still hasn't been broken. The fact of the matter is, the United States ranks 64th among all countries in the world in terms of women in elected in office and we, the women are the majority, we're 52% of the U.S. population, yet we only hold 25% of elected office. Why is that? And I think it's because disproportionately child care, elder care, and other family responsibilities still fall on women. SMITH: Right. 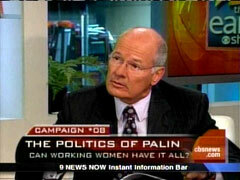 Now, if Sarah Palin's husband were in her spot, would we have asked that question in one second? I mean would we be even having -- would I be sitting here with three moms or three dads with similar situations having this conversation at all? MENIN: No because I think there's a real double standard. The question just isn't asked for men. There's the assumption if you're a man, that the child care is really still being left to the woman. And that's something we absolutely need to change in society. IOVINE: Well, the interesting thing is it's not asked of him because he's not breast feeding right now. She is. There are certain things that try as we might, you know, I went to school, got my law degrees, did everything right with the guys and no one offered me a class in postpartum depression or breast leaking while, you know, in court. It just still -- there are certain biological things that are different between the -- between the genders. But also I think it's because it's -- this is an interesting case because this is the man, I don't know if he's always been in charge of child care. But it seems that they've made this big decision right now that he's going to make. SMITH: That remains to be seen. Fair or unfair, all this -- this whole conversation, and do you still feel there's a double standard? WITTER: I think it's healthy, I think it's normal. I think I'm a working mom and I do it all. I wrote a book and had a baby in the same year and I'm a C.O. of a company. And it's a hard decision, I think, every woman sort of goes through it. So, for me it's been a time just to take stock and go, 'wow, thank God I have a helpful husband, I made the right decision for myself, and I want to keep working full time.' And every woman needs to make that decision for herself. SMITH: Alright, thanks very much for being here this morning. Really do appreciate it. I suppose we're going to continue to have this conversation, right? Julie Menin, Lisa Witter, Vicky Iovine. Thank you. Let's go back to Maggie in St. Paul. RODRIGUEZ: I can tell you everybody at this table has been having that conversation, Harry.